A simple menu that I'll miss when away from home and away from Indonesia is Nasi Goreng (Fried Rice). Some chinese or malay or even indian food stall in Singapore may serve fried rice as well, but It's just different from what I normally have at home. Cooking Fried Rice is a tricky yet fun for me. I can cook with 101 possibilities, mix and match the ingredients we have in fridge, I can cook left over rice, and it's a meal that you can eat without any additional dish. You may find the ingredients are too many or maybe you don't have all in your fridge. Dont worry, it's just a basic recipe and you may modify it. 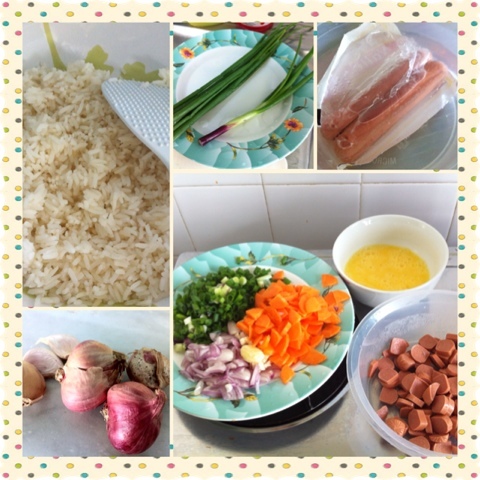 However, some ingredients may be significant in creating a homy taste Nasi Goreng. Prepare pan/wok on stove and turn on fire. Make sure there is no water drop on pan before pour the cooking oil. Water an oil only in a hot pan is not a good combination for cooking. Heat oil, then put shallot and garlic as soon as you think that the oil is hot. Do not let the oil produce smoke, it means you will burn the shallot and garlic immediately. Put chopped carrot and sausage. If you prepare raw meat, cook it first before combine them with carrot. Stir until carrot change color into slightly lighter color. Put light soya sauce, rice, sweet soy sauce and tomato sauce. Stirr well until the rice mix evenly with all souce. In this stage try to put a small fire, since rice will get burnt easily. Do not tempted to add any water if they do not blend easily. Keep stirring, take your time. Turn off the fire if needed. Put salt and pepper. Stir again for a while. Pour beaten eggs on the outer line of fried rice (as shown in picture). In this moment, stop stirring the rice, an observe until the eggs slightly cooked and solid, then start to mix again. Taste your fried rice, if it's not salty, you may add salt or light soy sauce accordingly. After everything is done, put spring onion on last step. Some of you may hate spring onion and think that it's not significant. But believe me it does contribute to the fried rice perfection. Stir again until the spring onion mix well in the rice. I think the main difference between indonesian style fried rice and others are the amount of shallot, garlic and the sweet soy sauce. Please have these ingredients to make a nice nasi goreng. 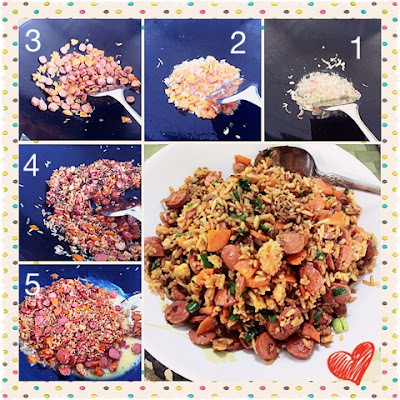 Amount of ingredient is important for balance of fried rice, but the most important thing in cooking fried rice is the sequence. The best sequence that i know in cooking fried rice so far is this one. Some prefer to put eggs in earlier stage, but i prefer to put later. Keep cooking and you'll know which sequence or amount of ingredient is suitable or which ingredient you may omit. Mixing rice and those ingredients are sometimes frustrating for beginners. So I suggest to start with 1-2 portion only. Btw my recipe is enough for 2 persons or 3/4 small portions. Use loose rice and put wok in low heat to make stirring easier. Please share to me you experience or experiment in cooking fried rice. I'll be happy to hear from you. First timer and have any problem? Please share, me or any of reader may help you to solve the problem. Btw, this recipe will make the fried rice very dry (typical "nasi goreng abang2", roadside nasi goreng) or a bit wet? Instant seasoning basically replace the shallot, onion, salt, and sauces. I rarely use that actually, you can try and compare. I'm not sure whether it's like abang2 one or the wet one. Can you explain what do you mean by the wet type fried rice? I think, the unique taste of street fried rice is the big flame and cast iron wok they use. Somehow, the aroma and taste of that is irreplaceable. Second possible thing is due to type of rice (loves water or not, if you know what I mean) and also if we use newly cooked rice, the resulted fried rice will be wetter compared to, let's say, if we use morning rice for evening cooking.